USS Bonhomme Richard arrives at Fleet Base East, Sydney, Australia ahead of Exercise Talisman Saber 2017. 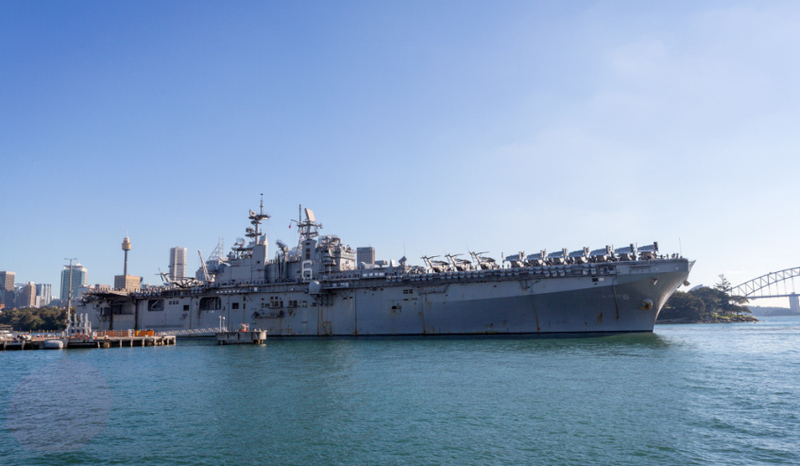 Australia’s largest military exercise, Talisman Saber, was officially opened aboard the United States Landing Helicopter Dock the USS Bonhomme Richard (BHR) off the Sydney coast. Minister for Urban Development Paul Fletcher, representing the Minister for Defence, and the US Charge d'Affaires James Carouso officially announced the start of the combined military exercise taking place from late June through to late July. Field training will occur in Shoalwater Bay Training Area, near Rockhampton and Mount Bundy Training Area, south of Darwin. The minister was joined by the US Pacific Forces Commander Admiral Harry B. Harris, Jr and Officer Conducting the Exercise, Australia's Chief of Joint Operations Vice Admiral David Johnston, along with other senior Australian Defence Force personnel. VADM Johnston said the exercise is important to highlight and certify the interoperability between the forces. "Talisman Saber is the premier Australia‑United States bilateral exercise," VADM Johnston said. "This year, we are pleased to see personnel from New Zealand, Japan and Canada embedded within Australian and United States units." Over 33,000 military personnel will participate in the largest bilateral military exercise between the Australian Defence Force (ADF) and the US military. "The exercise provides invaluable experience to ADF personnel to improve combat training, readiness and interoperability, exposing participants to a wide spectrum of military capabilities and training experiences," VADM Johnston said. Focused on mid-intensity, high-end warfighting, Talisman Saber 2017 will incorporate force preparation activities, Special Forces activities, amphibious landings, parachuting, land force manoeuvre, urban operations, air operations, maritime operations and a number of live fire components. "Regular training and exercising between our military forces serves to enhance our combat readiness and interoperability," VADM Johnston said. "This enables our military forces to be prepared and capable of meeting future security challenges in our region and globally." Personnel will also operate from Australia in Darwin, Townsville, Brisbane, Newcastle and Canberra; and from the US in Hawaii, Indiana, Virginia, Colorado and Washington. Only one of Australia's LHD vessels, HMAS Canberra, will participate in the exercise as HMAS Adelaide is still undergoing sea trials since issues with the propulsion system emerged.